Calls have been made for money originally earmarked for Rugby’s second train station to be used to improve the area around the existing station. 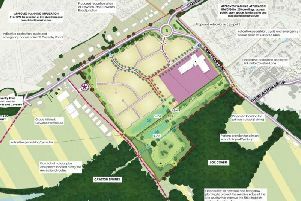 The £11 million Rugby Parkway Station was approved by county councillors in 2015 and set to be built on the A428-Crick Road, on land between existing housing and the Daventry International Rail Freight Terminal (DIRFT). Work was expected to begin in May this year, with a completion date of December 2019, but the plans have been put on hold after £4 million of funding from an organisation was withdrawn when Warwickshire County Council could not meet the funding deadline. The Coventry & Warwickshire Local Enterprise Partnership’s (CWLEP) had allocated £4 million from its growth fund to build the station on the condition Warwickshire Council would secure an additional £5 million of government funding - in addition to the £2 million it had already pledged. The withdrawal of the £4 million from CWLEP means the project has now hit the buffers. Rugby MP Mark Pawsey said it now looks like the plan will not be picked up for some time. He intends to write to Warwickshire County Council to ask that it release the funds meant for the Rugby Parkway Station to instead improve the roads around the main station in the town centre. Mr Pawsey said: “Warwickshire County Council set aside £2 million for its proposed new parkway station at Houlton and now that it seems the project will not be coming forward any time soon I firmly believe that this money should be used to improve the roads around Rugby station. “This March I convened a meeting with representatives from the Rugby Rail Users Group, Virgin Trains and Warwickshire County Council to discuss access and congestion issues around the station. “The council should now use this opportunity to address these long-standing congestion issues and Virgin Trains should in turn increase the parking capacity to meet the growing local demand. Stephanie Clifford , chair of Rugby Rail Users Group (RRUG) said she believes it could be ten years before the Parkway Station could be seen again. She said she believes the council, viewing an extra station as essential, will come back to the plan when possible - and that could be when HS2 opens.